Dolby Atmos creates powerful, moving audio by introducing two important concepts to cinema sound: audio objects and overhead speakers. Together, these completely change how soundtracks are created and heard.Traditional surround soundtracks confine all sounds to a small set of channels that can deliver sound to you from only a few perceived angles. They cannot put sound above you. Further, sounds exist only as part of a channel mix. If one sound is emphasized in a traditional mix, another must be diminished. With more than 1,600 screens* and 400 titles, Dolby Atmos is transforming the world of motion pictures. 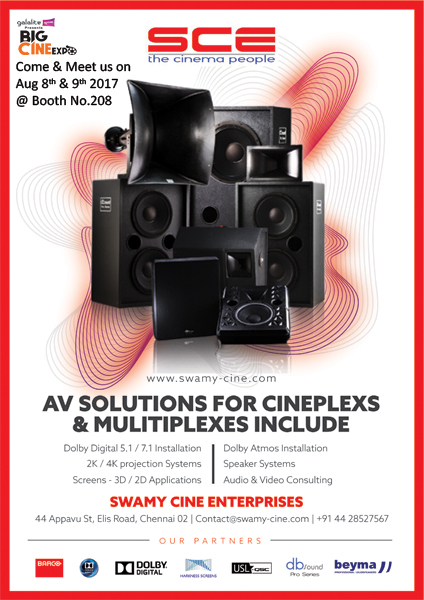 The Dolby Atmos Cinema Processor CP850 is the complete audio solution for today's digital cinemas. Dolby Atmos is supported by all major Hollywood studios and countless international distributors. More than 465+ titles have been mixed in Dolby Atmos, with 152 titles mixed worldwide in 2015. 70 percent of the top 30 grossing movies worldwide in 2015 were mixed in Dolby Atmos. Dolby Atmos is installed in more than 60 countries worldwide. More than 100 mixing facilities worldwide use Dolby Atmos. The Dolby Atmos footprint has grown 80 percent since CinemaCon® 2015—from 1,000 to 1,800 screens installed or committed to worldwide. Since September 2015, Dolby Atmos has installed more than 400 screens worldwide—more than the entire footprint of competing immersive audio formats combined. Rendering up to 64 speaker feeds provides an unmatched audience experience. The latest Dolby Lake EQ and 1/12th octave EQ resolution optimizes playback for all content types, even in acoustically challenged environments. Flexible configurations provide all the common I/O interfaces for the modern digital cinema. Automated calibration ensures consistent, high-quality playback for each movie. 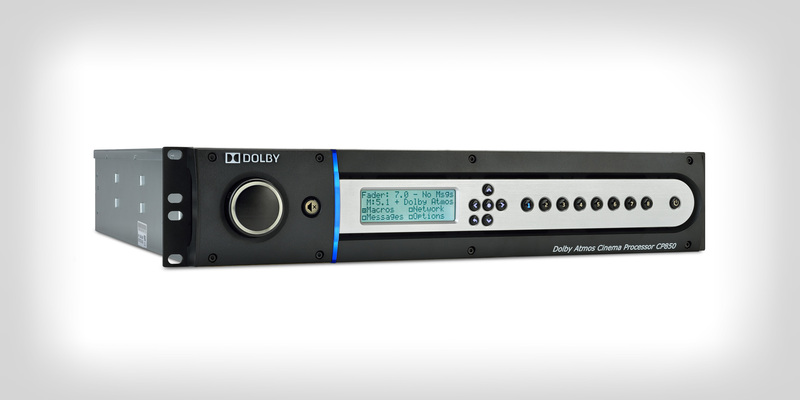 The Dolby Digital Cinema Processor CP750 provides easy-to-operate audio control in digital cinema environments. It supports innovative Dolby Surround 7.1 premium surround sound and integrates seamlessly with existing technologies. Designed specifically for digital cinemas, the Dolby® Digital Cinema Processor CP750 delivers the best in surround sound from all content sources. In addition to the digital cinema formats (Dolby Surround 7.1 and 5.1 digital PCM), it also decodes Dolby Digital Surround EX™ (bitstream), Dolby Pro Logic® II, and Dolby Pro Logic. Integration with Dolby Show Manager software gives you a drag-and-drop interface so that you can easily build volume cues and digital input selection into a show. You also get real-time volume control from any Dolby Show Manager client and seamless processing of ASCII commands from third-party controllers. The Dolby CP750 is ready for the network operations center (NOC) and can be monitored and controlled anywhere on the network for status and function. 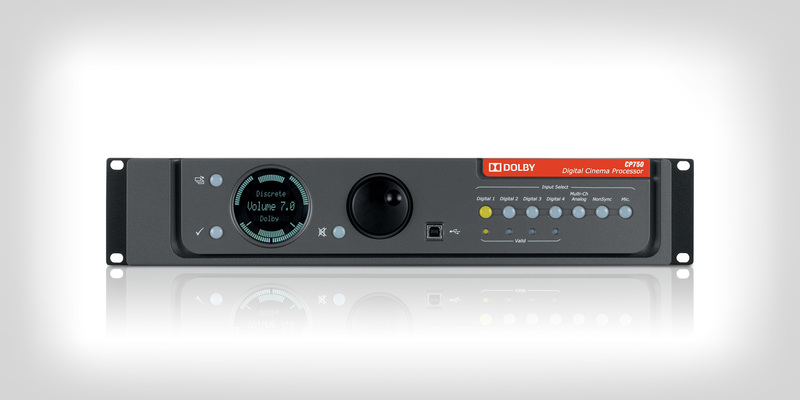 Hearing-impaired (HI) and auxiliary analog outputs complement the Dolby CP750's main eight-channel audio output. The JSD-100 Digital Cinema Processor is an eight channel digital audio processor with the capability of expanding up to 32 channels. Hearing impaired (HI) and visual impaired narration (VI-N) channels included. The JSD-60 Digital Cinema Processor is cost-efficient and specially designed for digital cinema applications. The JSD-60 includes six standard formats, plus one that is completely configurable. A built-in bypass audio circuit ensures that the presentation continues. Digital formats include an eight channel AES/EBU input, one coax (S/PDIF) and one TOSLINK optical, both with optional Dolby Digital® and DTS® decoding. Analog formats include a six channel balanced input, stereo unbalanced input with matrix decoding, and one microphone input with phantom power. Outputs include eight channels of balanced analog audio, plus HI/VI-N balanced outputs. Optional three channel bi-amped digital crossover. One fully configurable format button to address such issues as audio level changes or 5.1, 7.1 switching. Three automation inputs include one DB25, one RS232 and one RJ45 Ethernet. Remote monitoring via 10/100Mbps Ethernet and local configuration via a USB port on front panel. SD memory card to backup and store all settings. High Quality three channel 2 way crossover for Medium - Large Size professional cinema Applications. Advanced front panel assembly technology, absolutely no noise during operation and high reliability. Swamy Cine Enterprises (SCE) was established in 1979 in Chennai, India. It all started by blessings of Mr.A.Kuppuswamy (1925-1971) Mentor of our chairman Mr.M.Duraiswamy has started his career in cinema in the year 1964, so with the Professional experience from his guru he started manufacturing 35mm Cinema Projectors & Carbon Lamphouses in the brand name of "SWAMY" for theatres in India. Ellis Road, Chennai Tamil Nadu, India.